Last time I talked about π donation and π donors, which are atoms capable of forming a new π bond with an adjoining C-C π bond. The upshot of π donation is that these molecules will have an important resonance form where the carbon at the far end of the π bond (away from the π donor) has a negative charge. Todays topic is π acceptors, which is, as you might imagine, exactly the opposite phenomenon as π donation. 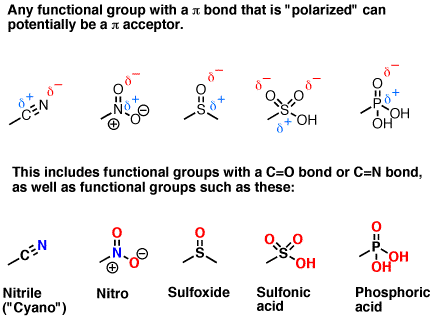 Recall that in π bonds that are polarized toward a more electronegative atom, we have an important resonance form where the less electronegative atom (usually carbon) bears a positive charge. That would be the one on the left, below. 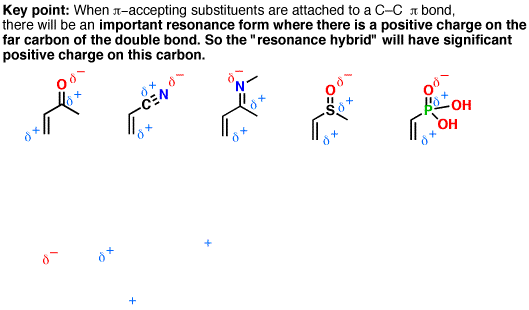 However, when we have an additional double bond attached to an electron withdrawing group, we can also draw an additional resonance form where there is a positive charge on the far carbon. That would be the one on the right. These are both important resonance forms. Note that they both have an equal number of charges (two) and they are polarized so as to put the negative charge on the most electronegative atom (oxygen). They will each make an important contribution to the resonance hybrid of this molecule. (The question of which resonance form is more important for the purposes of reactivity is an important question I’m deferring to a later date. The short answer is that it depends greatly on the reaction conditions chosen). 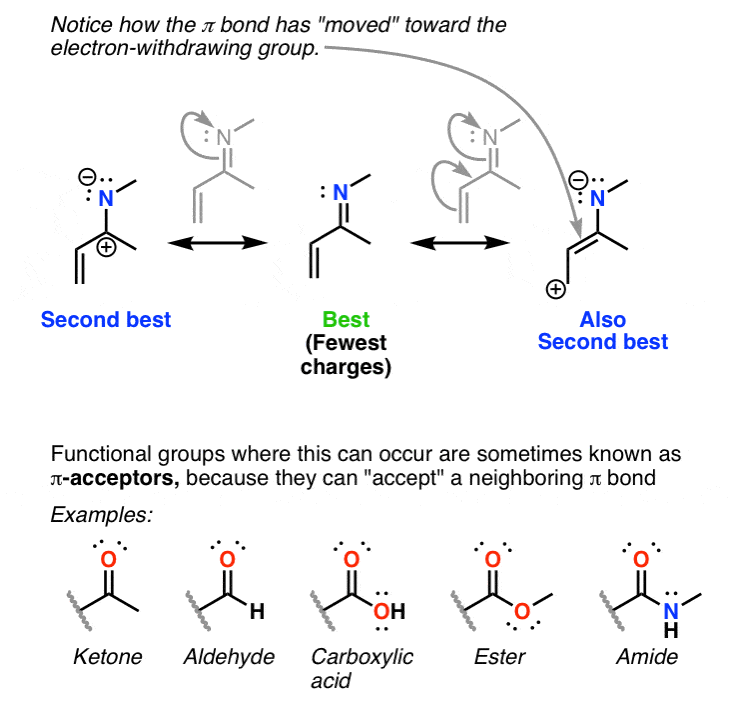 Now: see how the double bond has “moved” toward the electron-withdrawing group? For this reason, we call these types of substituents “π acceptors”, because they can “accept” a π bond. 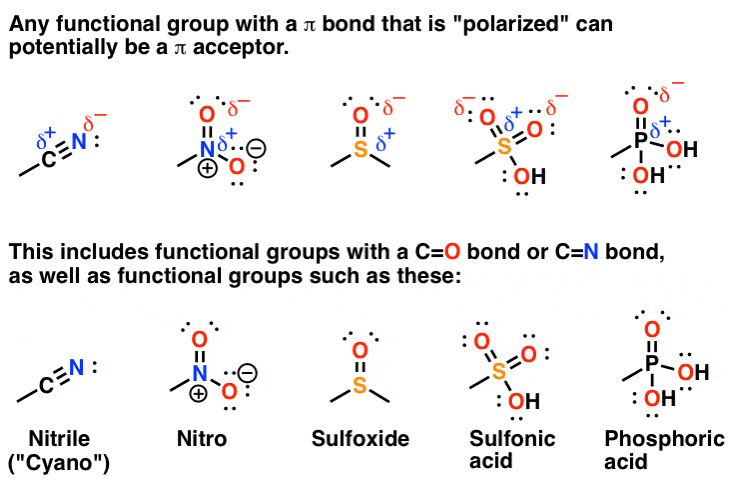 This is a general phenomenon not just for functional groups containing C=O and C=N groups, but also for functional groups such as nitriles, nitro groups, sulfonyls… essentially any polarized group containing a π bond. You can also think of it as an extension of a phenomenon we observe for resonance forms that have an empty p orbital, such as carbocations and other groups that contain an empty p orbital (such as this boronic acid, pictured). This is the last big post planned on introducing resonance concepts for the time being. 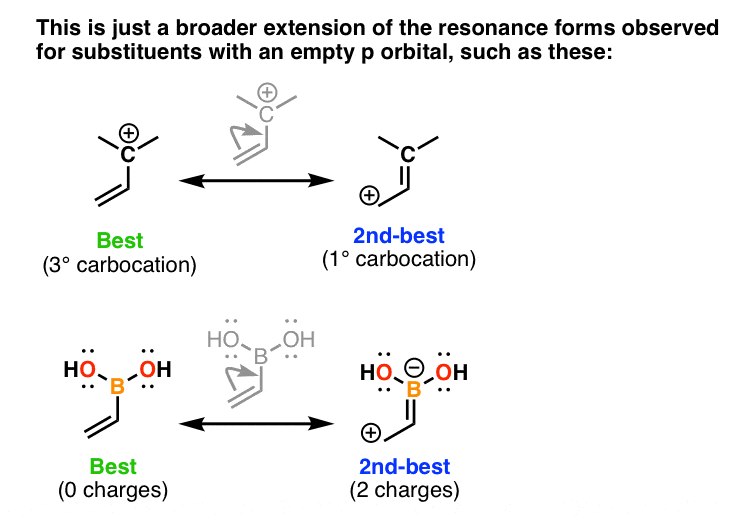 After a summary, and then some examples of what NOT to do, I want to show how you can apply this skill (that of evaluating resonance forms in determining electron density on a molecule) toward figuring out the reactivity of a given molecule. Disregarding the reaction conditions, why isn’t the left resonance form in the first figure more stable? The carbocation in “second best” is more substituted than the carbocation in the “also second best” structure. Yeah, the one in the left is clearly more stable as it is a tertiary carbocation, while the “second best” on the right has a primary carbocation, which is very unstable. I wonder this question too. The difference should be quite small. One could make the argument that the form on the right has a more substituted double bond, so it should make a greater contribution to the resonance hybrid. I’ll see if I can find someone to calculate the difference in stabilization energies. I believe it is because it fulfills the octet rule in the “best” structure, while the second best is a tertiary carbocation.